In Stage 1 we talked with community leaders, traditional owners, community members, decision-making groups and staff in government organisations (Australian, NT and Local) about local Aboriginal and Western governance in the community. How do they work together? What is working well, and are there problems? What changes can be made? What would people like to know more about and what skills would they like to develop? In stage 2 we continue to work in each community following the plans we made together in Stage 1. This involves working as mentors with individuals or groups; running workshops; helping with meetings, planning or evaluating; developing resources and documenting what happens. 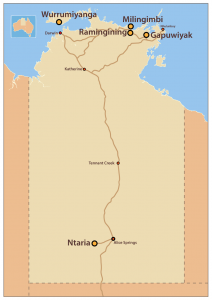 Project supported by Australian Government, the Northern Territory Government and the Local Government Association of the Northern Territory. Project implementation by Northern Institute, Charles Darwin University. Partners include Merri Creek Productions, Rise Up and Tangentyere Council.